CAES is exactly as its name suggests; air is compressed and stored under pressure. Release of the pressurised air is subsequently exploited to generate electricity. Although the storage of compressed air is clearly a means of storing energy, it is only when it is considered in conjunction with the gas turbine that it makes complete sense from a power generation perspective. A gas turbine consists of two major components. These are a compressor and a turbine. Conventional gas turbines used in aero applications or for power generation have the two components mounted on a single drive shaft. During conventional operation, air is drawn into the compressor and compressed. This compressed air is then directed into a combustion chamber where it is mixed with fuel and ignited. Heating the compressed air increases its energy content significantly. The hot compressed gas is then released through the machines turbine blades, causing them to rotate and generate electricity or motive power. Although a gas turbine normally has the compressor and turbine closely integrated, there is no reason, in principle, why compression should not be carried out separately, and at a different time to power generation. This is the crux of the CAES plant. 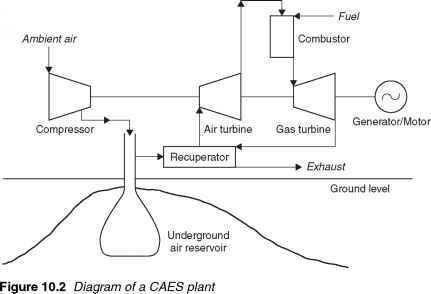 In a CAES plant the compressor and the turbine are separated. By use of a system of clutches, each can be linked, separately, to a motor generator. In storage mode the compressor stage of the gas turbine is driven by the reversible motor generator using off-peak power from the grid system. The product, compressed air, is stored in a special cavern. When the power is required, air is released from the cavern into a combustion chamber, mixed with fuel, ignited and allowed to expand through the turbine section of the system. Under these conditions the motor generator is used in generation mode to produce electricity.